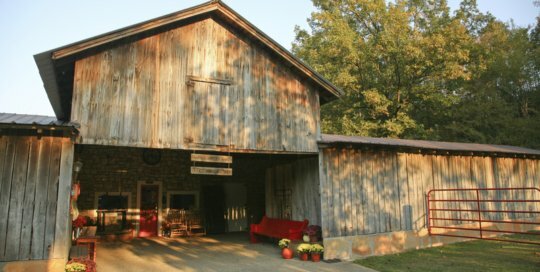 Visit an authentic Western Horse Ranch! 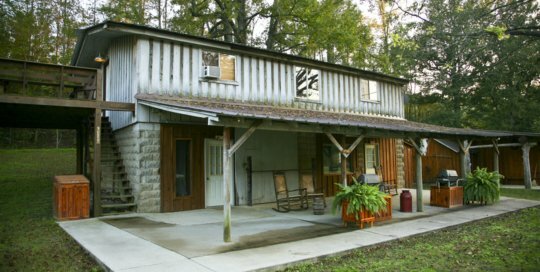 A 100 year old guest ranch in historic Hot Springs National Park nestled in the Scenic Ouachita Mountains of Arkansas. Featured in: Southern Living! 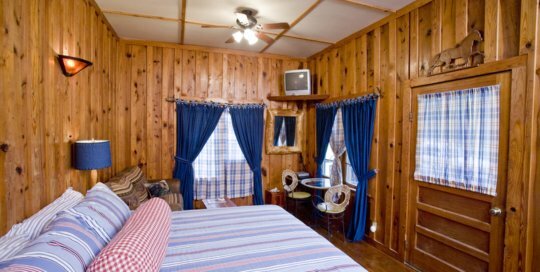 This Cowboy themed suite has a nice living room / bed room combination and is trimmed in wild cherry cut here at the ranch. It also has a cute breakfast / kitchen combo. The bath (with 2 person Jacuzzi) & gas log fireplace are also trimmed in cherry. The Cowboy and Homestead are adjoining suites. Great views from the bedroom and rock patio. This suite has a beautiful gas log fireplace and antique mantle as a focal point. The fireplace is native stone. The beautiful cedar, oak and hickory walls set off the Jungle theme decor. Has a full separate kitchen. You can watch the fireplace from the bed after a soak in the Jacuzzi. The huge oak slab porch outside has a great view across the lawn and lake. Rocking chairs provide a great complement to the Jungle theme. Sawmill & Jungle are next door to each other. Wood burning fireplace. Trimmed in 8 different types of native wood this suite is decorated in a country theme of the hard working pioneers. Beautiful cedar, oak and hickory walls. Full kitchen. You can watch the fireplace from the bed - after a soak in the Jacuzzi. The huge oak slab porch outside has a great view across the lawn and lake. Furnished with rocking chairs on the porch it is sure to capture the heart. Sawmill & Jungle are next door to each other. This extra spacious suite has a large kitchen, living room and separate bedroom with King bed. Includes a two person corner Jacuzzi adjoining the bedroom and it has a gas log fireplace. This suite was the original homestead at the ranch. Homestead and Cowboy are adjoining suites. Nice views from kitchen & bedroom. Rockers on the porch. This spacious suite is located above the Pine & Oak suites so we call it The Loft. Equipped with a large kitchen, living room and separate bedroom with King bed. There is a set of bunk beds at one end of the den for families up to 4. This suite is popular for guests wanting to watch the horses come & go from the large deck. 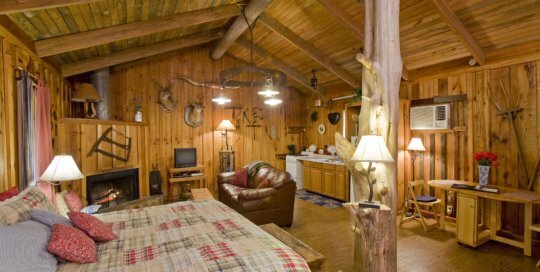 Horses are the theme in this suite & it has a gas log fireplace and standard 5' Jacuzzi tub. Walls are solid oak cut from trees here on the ranch. This suite has standard 5' Jacuzzi tub, king size bed, kitchenette & gas log fireplace. A nice covered patio with rockers, a gas grill and great view help one unwind. Walls are notty pine cut from trees here at the ranch. This cozy suite has a standard 5' Jacuzzi tub, King bed, kitchenette & gas log fireplace. 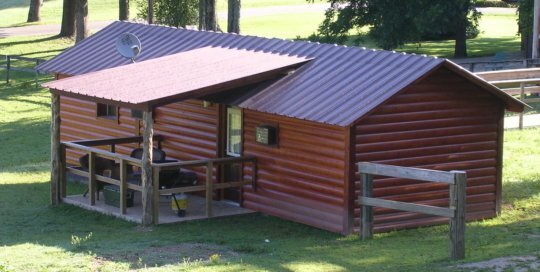 Nice covered porch with rockers & gas grill has a great view of the ranch. Located next door to the Oak suite. This is the original suite in our 100 year old stables. 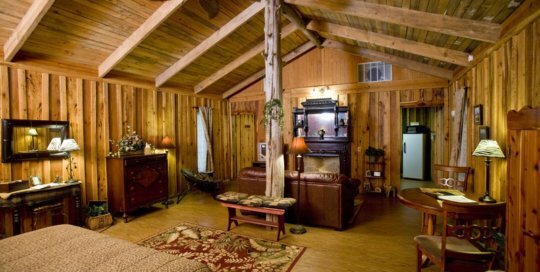 The den is all stone with a cathedral ceiling, a wood burning fireplace & leather furniture. Includes separate full kitchen and king bedroom adjoining the bath with clawfooted double slipper whirlpool tub. TV's are in the bedroom and den. Nice view of the horses from the covered porch and if you like just step over to the fence and feed the horses an apple or two. This suite is named after our first big gray appaloosa with a lot of attitude!